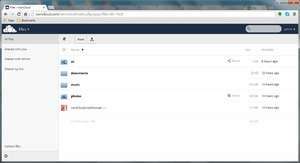 ownCloud is an open source file networking tool which allows people to create their own cloud, similar to Dropbox or Google Drive. The application is not at all difficult to use and provides an alternative solution to sharing private files with other people -- whether they are colleagues or friends and family. The main point of ownCloud is to reduce reliance on other companies for cloud hosting solutions and taking that back in to your own hands. The application interface of the program includes different tabs including "Account" for account setup, "Activity" for cloud account activity, "General" and "Network". Version 2.5.4.11415 is a freeware program which does not have restrictions and it's free so it doesn't cost anything. For security reasons, you should also check out the ownCloud download at LO4D.com which includes virus and malware tests. Additional screenshots of this application download may be available, too. 4.5 out of 5 based on 30 ratings. ownCloud download been highly rated by our users.